Last week the rain progressed to slushy freezing rain and eventually gave way to thick clumps of wet snowflakes. 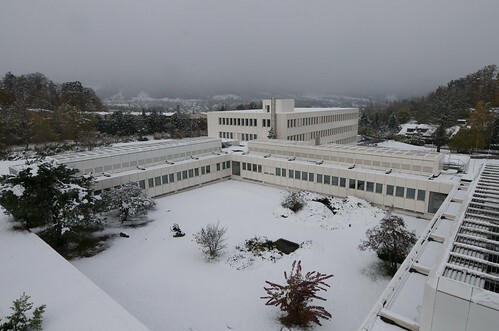 What resulted was a record amount of snow for this time of year in Zürich. I took a few photos of the lab in the snow, including some shots from the roof of the main building. My office is located on the ground floor of the K building, the three-story building most distant in the above photo. The Nanoscale Exploratory Technology Laboratory announced recently will be built in the field to the right of the K building. Groundbreaking is scheduled for early next year.